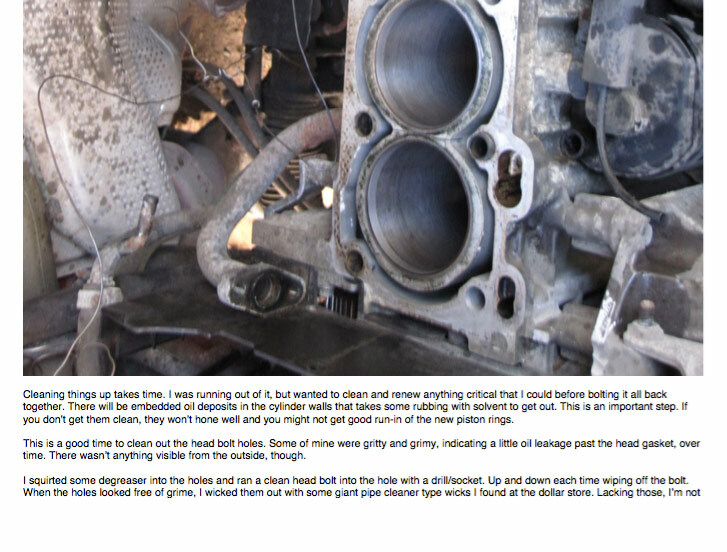 An MVS Forums Contributor puts together a 288MB, 30-page downloadable PDF monster filled to the top with how to do a Volvo 5-cylinder engine rebuild. The project lasted into the third week. Were I to do this again, I could do it in a week without difficulty. Maybe 3 days. MVS Forums Contributor and advanced shadetree-level mechanic JimBee puts together a 288MB, 30-page downloadable PDF monster filled to the top with how to rebuild your Volvo whiteblock engine. Then he makes it free, and passes it around. That’s the DIY Volvo repair community spirit right there, folks. 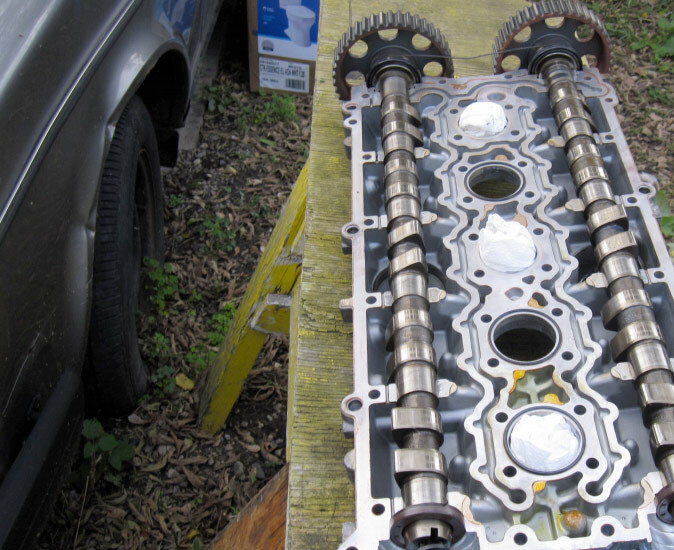 Download the 1996 850 engine rebuild tutorial PDF here. When we buy a car with a “dead” engine, of course, we don’t know what we might be getting into, which is reflected in the price. So it was with my “tinkertoy”. I got it running after a basic tuneup and oil change. The timing belt looked good enough to run for awhile. There were no coolant leaks and seals were all dry. Cleaning things up takes time. I was running out of it, but wanted to clean and renew anything critical that I could before bolting it all back together. There will be embedded oil deposits in the cylinder walls that takes some rubbing with solvent to get out. This is an important step. If you don’t get them clean, they won’t hone well and you might not get good run-in of the new piston rings. After the tuneup and fixing other peripherals the engine started and ran well but had a tinking sound. How I wanted the sound to be a lifter. I pulled them, had them professionally cleaned and checked, all were okay. It was something deeper in. Last summer I put it on Craigslist for $1,200, but I told prospects that whatever was tinking would need to be fixed. I would have helped a buyer who lived locally. No takers. I took it to 3 rebuilders for an opinion. They convinced me it was not a bearing, which I assumed because the oil light went out immediately upon starting. the pan off. I had a friend turn the engine by hand but I couldn’t see the cause of the tinking, everything looked normal. MVS hosts a couple of helpful tutorials on dropping the pan, so I won’t belabor that except that on the 850 turbos it’s not quite as easy as on the non-turbo. The hangup is the oil t-stat mount on the front of the oil pan under the crank pulley. I fussed and fumed trying to get the unbolted pan out for a couple of days and finally decided to lower the passenger side subframe. I have some video that needs to be edited on that, but you can see in some of these pictures how I got the pan out. Next PostNext Peeling Pillar Trim Fix – Double Sided Tape!